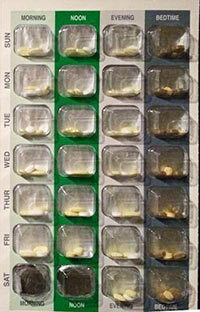 Blister packs, also known as compliance packs or bubble packs, can help people to keep track of their medicines. Blister packs contain designated sealed compartments, or spaces for medicines to be taken at particular times of the day. Blister packs are often used by people taking many different medicines and find it difficult to remember when to take their medicines. When prepared and used correctly, blister packs can help consumers remember to take their prescription medicines at the proper time and can help prevent certain types of mistakes. Pharmacists and pharmacy technicians are very careful in preparing blister packs, but the filling process is more complicated than it is for prescription vials. Dispensing mistakes occasionally happen. SafeMedicationUse.ca has received a report about a consumer receiving an incorrectly prepared blister pack from a pharmacy. The wrong number of tablets had been placed into a compartment, and the medicine had also been placed into the wrong time slot. Always check the label on the pack. Make sure that your name is on the label. Check the medicines listed on the label. Be sure they are the ones you were expecting. Be familiar with the medicines you take: their names, what they look like, and when you should take them. Before starting a new blister pack, check the appearance of the items in each blister. Check one row at a time to make sure they all look correct. If you take some medicines on some days but not others, check that these have been placed in the right spots in the blister pack. If there are changes to your medicines, take your new prescriptions and your current blister pack to the pharmacy. Ask them to repackage the medicines, adding the new medicines and removing any medicines you no longer need. Ask your pharmacist to show you what is different and to explain how to take the medicines properly. If you have any concerns, call your pharmacy before taking any of the medicines in the blister pack. Take the medicines in the blister pack at the scheduled times. If you realize that you forgot to take the medicines from one blister, call your pharmacist to ask what you should do. Don't take medicines from more than one blister at the same time without checking first with your pharmacist. Some medicines cannot be put into blister packs. Examples include inhalers, eye drops, and medicines that are taken only as needed. Store all of your medicines, including the blister pack, in the same place. Seeing all of your medicines together will help you remember to take the ones that are not in the blister pack. Ensure that the label on the blister pack includes accurate descriptions of the medications it contains and ensure that all the information is clearly visible. Counsel the patient or caregiver any time there are changes to the medications (including changes to a brand or changes in appearance). Incorporate reminders in the pharmacy computer system that will automatically remind the pharmacist of any changes that will be needed for the patient's next blister pack. Use a checklist to perform a systematic final check of the blister pack, especially to compare the patient's prescription(s) with the medication grid and the medications in the pack. Read the Multi-Medication Compliance Aids Guideline, published by the Ontario College of Pharmacist.